"Music, both vocall and instrumental, so good, so delectable, so rare, so admirable, so super excellent, that it did even ravish and stupifie all those strangers that never heard the like." - Thomas Coryat, after hearing 3 hours of music at the Scuola di San Rocco in Venice, 1608. From 14th century Gothic cathedrals to early 20th century skyscrapers, there have been International Styles in the arts, as the nobility and then multi-national corporations vied for the best artists, architects and composers from around the world, who influenced each other and created new styles through cross-fertilization. 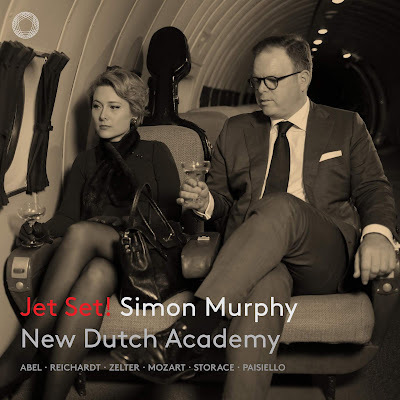 Simon Murphy's latest theme album tells the story of 18th century musicians as if they were from the mid-20th century Golden Age of Travel: "classical glitterati" going to the musical capitals of Europe to show off their wares. This is stylish programme design and very clever marketing, but it would mean nothing without top-class musical values, and we have that here in spades. First of all, the music itself, full of rarities, and even a number of recording premieres, is of very high quality. Sure, the aria from Mozart's Marriage of Figaro does stand out a bit, but the symphonies, concertos and arias here are always interesting and occasionally quite brilliant. And Murphy manages the transitions from the 18th century to the 21st, with various stops in the 20th century along the way, with verve, panache, and finely modulated levels of style. A simply wonderful time! New York has a long tradition of providing a warm welcome to foreign composers, and Edward Elgar was no exception. He made a big splash in his visits early in the century, and his American reputation was at a high point in the 1940s, when these three recordings were made by top conductors with the top New York musicians. Yes, Toscanini takes the Enigma Variations at quite a clip, and you occasionally want to hail the orchestra as it speeds by. The Nimrod Variation, at less than three minutes, is unsentimental but it never comes across as the least bit unfeeling, and the conductor brings it to a satisfyingly heroic - and heartbreaking - finish. The Nimrod norm seems to be over four minutes, though the composer himself broke the 3 minute barrier in one of his own recordings, (he introduces his own kind of pathos though swoopy strings). It's fun to listen to a dozen different Nimrods in a row: I'd recommend it for a cold, overcast day like the Toronto one I'm writing this review in. Overall, I'm impressed with Toscanini's dramatic, occasionally even operatic, take on this great work, and his players are outstanding. The playing is as polished as a studio recording, and the fact that it's recorded over the air from a live broadcast shows the very high level of preparation, and the skill of both musicians and conductor. 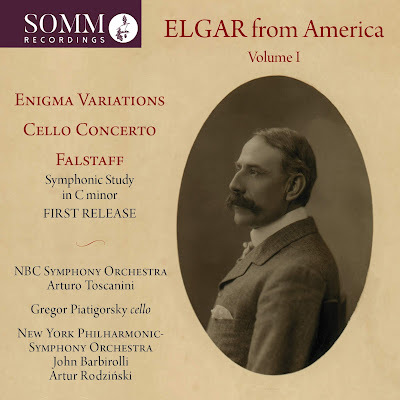 The stakes don't seem as high in the next recording included here: John Barbirolli, the New York Philharmonic and Gregor Piatigorsky provide a relaxed Cello Concerto that I wouldn't rate at the very highest level, though it's still very fine. It does have considerable value as documentation; this great cellist never got around to recording this great concerto in the studio. I wish the sound here were as good as the Toscanini recording. The final work on the album is a commercial release premiere: Artur Rodzinksi conducts the New York Philharmonic in a very good Falstaff. Alas the sound is even dimmer than the the Cello Concerto, though of course we all make allowances for these historic recordings, and the feeling of actually being there in this time of musical giants makes up for so much. Speaking of being there, I didn't imagine myself sitting in evening dress at Carnegie Hall, but instead comfortably in an armchair in my housecoat and slippers, listening on an RCA Tombstone Console Radio. This album will be released on May 17, 2019. Heinrich Hoffmann was an almost exact contemporary of Beethoven's, and his opus 3 String Quartets were published only a few years before Beethoven's ground-breaking opus 18 set. But these beautifully balanced examples of civilized musical conversation are more like (in style and pretty darn close to quality) Haydn, and especially Mozart, than the more abrupt young composer from Bonn. 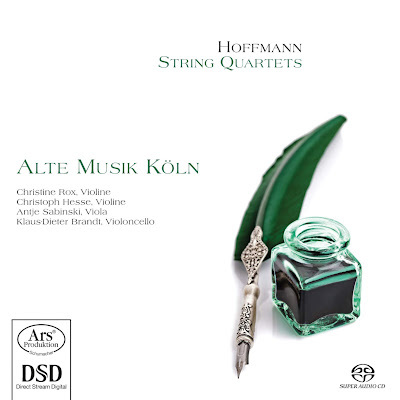 Everything about this project from the original instruments ensemble Alte Musik Köln is well-researched, thoughtful and sophisticated. One can easily imagine oneself listening to the great virtuoso musicians of the day, playing in the drawing rooms of aristocrats, temporary respites from the social change and danger of the Napoleonic wars in Germany at the time. Time travel really does work in the musical realm, and we can experience the same enlightenment and peace that this music still provides in our own troubled times. This disc will be released on May 17, 2019. In his entry on "Spoof Articles" in the New Grove Dictionary of Music and Musicians, David Fallows uses Don Pietro Gnocchi (1689-1775) as an example of someone who makes these kind of hoaxes superfluous, because his life and works are so bizarre. There are plenty of bona fide musicians whose names and lives look like outrageous fiction. One need only mention Gnocchi, who became maestro di cappella at Brescia Cathedral at the age of 85, composed a Magnificat entitled ‘Il capo di buona speranza’ (alongside many other works with improbable titles) and wrote an unpublished 25-volume history of ancient Greek colonies in the East (the long MGG article even includes a suitably lugubrious portrait). This disc has been on more than a few times since I first heard it a few weeks ago. 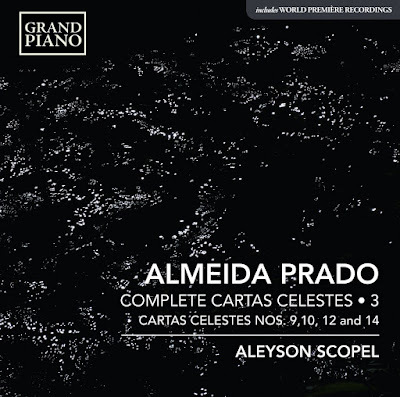 Along with only one other disc (of sacred music that I'll mention later) I've now heard nearly the entirety of the composer's discography*, and I must say I'm a big fan. Gnocchi was a close contemporary of Vivaldi, with whom he shares a dramatic flair as well as the infectious, lilting rhythms that make one think of Carnival time. 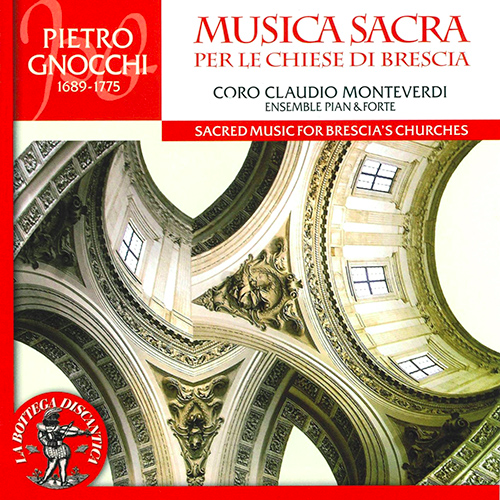 But Brescia is close to the Romagna as well as Venice, and the more heart-on-one's-sleeve sentimentality of the followers of Arcangelo Corelli comes to mind in this emotional music. I commend to you all this disc of sacred music by Gnocchi: Musica Sacra Per Le Chiese Di Brescia, by Coro Claudio Monteverdi di Crema and Ensemble Pian and Forte, released in 2010. 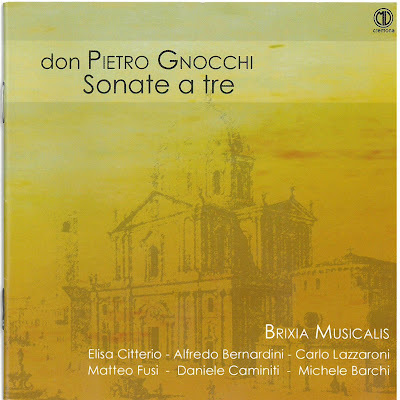 It's not available on Amazon.com or Spotify, but you can listen at the Naxos Music Library. Sacred music is where the composer put by far the bulk of his energies, and the music is all of the highest calibre. * I was pleased to see that there's a second recording of the Six Sonata a tre, by Martin Jopp and Main-Barockorchester Frankfurt, on Aeolus in 2016. I haven't heard it yet, but it's on my radar! This album will be released on April 5, 2019. Squash & goat's cheese is an addictive combination, and this colourful dish is sure to become a family favourite. 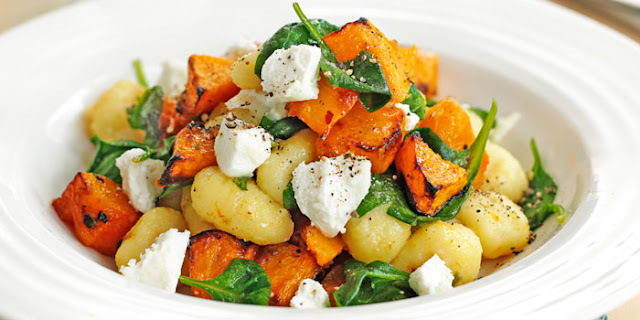 Just stick the squash in the oven, boil your gnocchi, combine and serve. The solo violin is eliminated as regards audibility – something that the composer has consciously chosen – by letting the soloist often play in unison with the leading parts. The composer lets the soloist fill in passages totally inaudibly within the orchestral mass. This, of course, is a challenge for today's recording producers and engineers: they're very good at allowing us to hear every detail in a score through technological means plus microphone choice and placement, as well as the choice of recording venue to find a proper acoustic to match the music. Luckily, in this case, we're dealing with BIS, whose default is rich and full rather than bright and exposed. 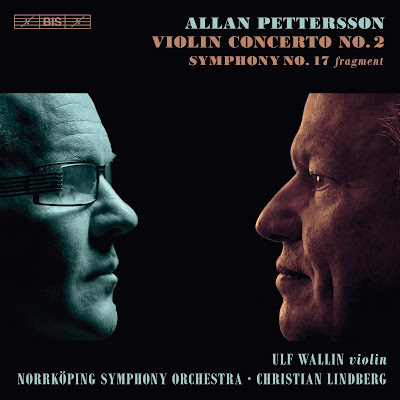 And we have the Pettersson Dream Team in Christian Lindberg and the Norrköping Symphony Orchestra, who are completely at home in the music of the great composer, as they come to the end of their epic traversal of Allan Pettersson's complete works. Finally, the musicianship of violinist Ulf Wallin wins out, over, I might imagine, some of the more ego-driven soloists of his most ego-drenched instrument. In the end one hears the sad, even agonizing music as it was designed by Pettersson, and the touches of grace and redemption that occur, particularly toward the end, are all the sweeter for it. The short fragment that might have become the 17th Symphony does not break new ground, nor show the way to any major turns on their way from the composer's music written before. It's the last music Pettersson wrote, so one goes in with the same feeling as with the Lacrimosa from Mozart's Requiem or the unfinished final fugue in Bach's Art of the Fugue. Lindberg and his fine musicians give this often robust music a straight-forward, unsentimental reading, and they let the way it shuffles off at the end, into the silence, speak for itself. Let it echo in the silence for a while when you listen to it; this says as much about the abyss as whole symphonies. This disc will be released on May 3, 2019. In a 1995 interview the great jazz composer and performer Ornette Coleman said he had always wanted musicians to play with him “on a multiple level. I don’t want them to follow me, I want them to follow themselves, but to be with me." One of his regular collaborators during that period was the pianist Joachim Kühn; the two toured regularly in the 1990s, and released a recording together, Colors: Live From Leipzig, in 1997. Now, three years after the great jazzman's death in 2015, Kühn has released an album of songs by Coleman, a musical reunion in spirit and a fitting tribute to a close friend and colleague. 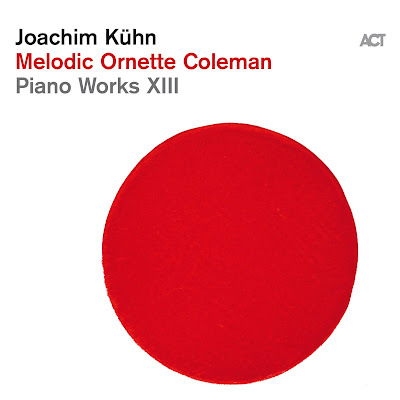 Kühn has harmonized Coleman's melodies in a way that might sometimes feel antithetical to basic "harmolodic" principles, but there's no sentimentality here, no hint of the lounge piano. The German pianist has a classical background - his hometown of Leipzig is Bach Country - and a wide range of influences from well before Bach to the Second Viennese School are evident in his reworking of Coleman's songs. But Joachim Kühn is an accomplished straight-ahead jazz composer and performer as well; he's as comfortable in both worlds as one can imagine. This project is an intriguing and stimulating thought-piece, but also satisfying music to listen to and to remember. The album cover features Martin Noël's work Ich liebe rote Punkte, from 2006. Thanks to ACT and Joachim Kühn for introducing me to such an interesting and talented artist! The shadow of Brahms' Double Concerto, written in 1887, looms over Kurt Atterberg's own 1960 concerto for Violin, Cello and Orchestra. The musical textures are of course similar, and Brahms himself wouldn't have found the late romantic language, which more or less ignores the seventy years of music history in between, that difficult to understand. Both works share an autumnal feeling; Brahms' concerto was his last orchestral work, and Atterberg's came close to the end of his own career. This recording is, surprisingly, a world recording premiere. I don't know why Kurt Atterberg's music isn't much more popular; his folk-inspired tunes are hummable, and there's often a slight harmonic edge that guards against sentimentality. Conductor Thord Svedlund keeps things moving briskly here, and the musicians of the Orebro Chamber Orchestra play the lilting folk tunes with the right amount of swing. 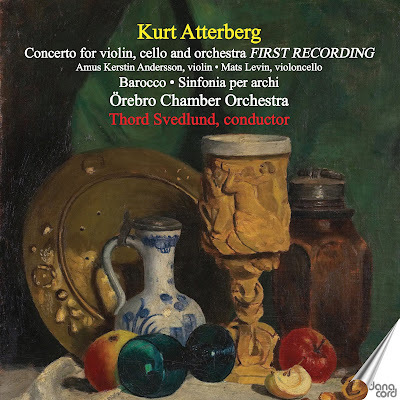 I also admire Atterberg's way with the neo-classical genre; his faux baroque music is appealing, though perhaps the tiniest bit bland. Still, this is a good selection of music by a composer who should be better known. Carly Rae Jepsen's 'Julien' Will Make You Cry At The Club - The opening track to Carly Rae Jepsen's forthcoming *Dedicated*, out May 17, is full of the feels. The Swedish guitarist Göran Söllscher plays Villa-Lobos’s Suite... - The Swedish guitarist Göran Söllscher plays Villa-Lobos’s Suite Popular Brasileira, in Tokyo in 1990. Thanks to Rodrigo Roderico for this video.